Ah Spring…we welcome you with open arms and happy hearts! What a long and formidable Winter it was. Soon to be a distant memory (thank goodness). Along with fresh air and daffodils come new ideas for our classrooms and a renewed enthusiasm for learning. By this point in the year our students have grown so much and are ready for new challenges. What can we learn from the changing seasons? How will Spring inspire us? Here are a few ideas to inspire you. A favorite in our classroom is doing a sticky shelf liner mural. This is new each time we do it, because we use different seasonal materials. For instance, in the winter we used cotton balls, red cellophane bits, tissue snow flakes and other winter colored bits. For Spring the teacher found small pastel feathers, tissue squares, shredded paper (the kind used to stuff gift bags), silk flower petals, and pastel cotton balls from the collage drawer (and her own collection). The great thing is, when you are done you can just stick it to a window or glass door. It’s a really lovely effect. Water colors make me think of April showers. 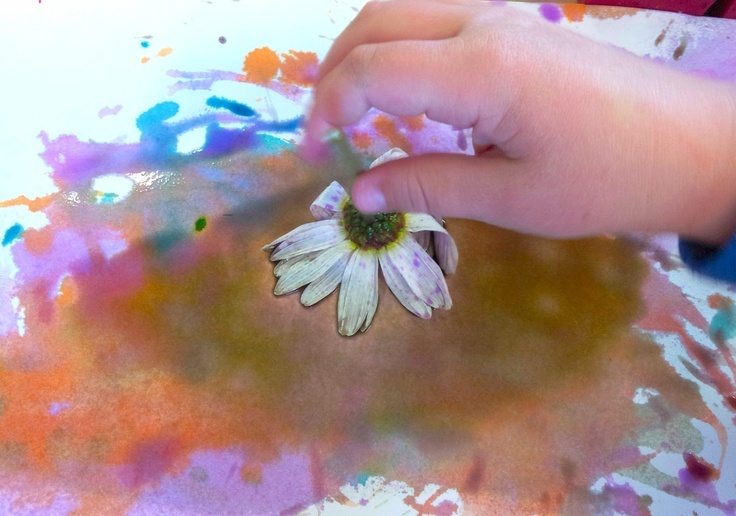 I love to buy fresh white daisies and let the children dip them into liquid water colors. You can dilute the colors as much as you like to create bold or light colors. One year I made the mistake of painting on squares of donated cut up matt board. The water caused the mat board to peel and separate. So sad. This year we will use heavy weight construction paper. It is fun to print flower shapes using unconventional items. The bottom of plastic drink b ottles can look like a flower, so can round kitchen sink scrubbers, a bunch of celery sliced cross wise, a pepper sliced, hand prints, finger prints, plastic forks and plastic gears, just to name a few. Experiment and see for yourself. The possibilities are endless. I don’t know who wrote this little poem. It was listed as “author unknown” but is one of those activities we do every year around this time. You can use the tune to “I’m a little teapot” and act out the words with your small group as your sing them. Of course you should visit my Etsy shop and TpT store for fun story ideas! Here is another good shop on Etsy for felt. 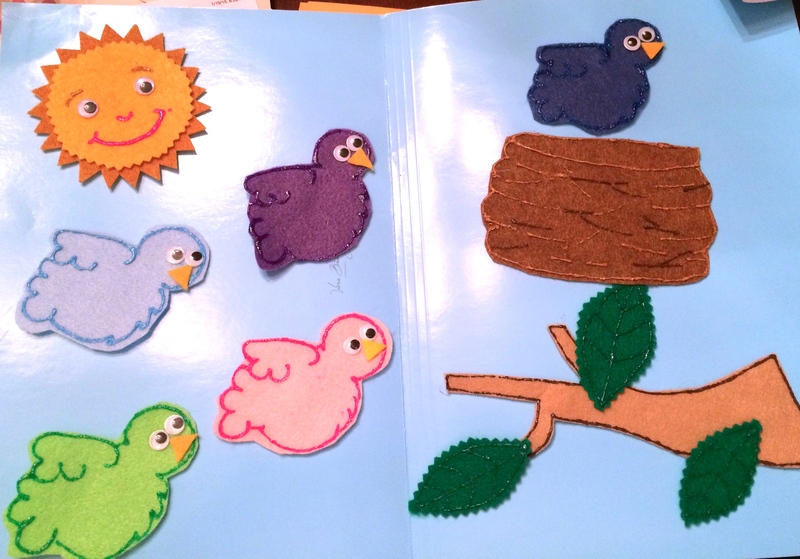 Felt Resources has many cute and well made stories to share with your class. Here is a good one for Spring! 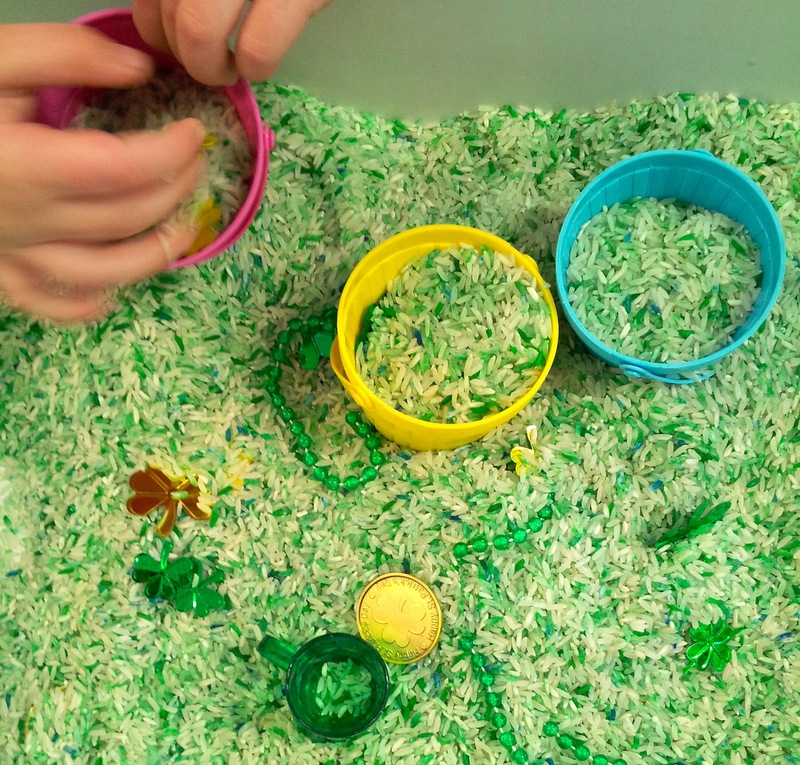 Growing seeds in the classroom is a classic and useful activity. The children love watching their seeds sprout and grow. But what else can we do to demonstrate growth and the changing season? 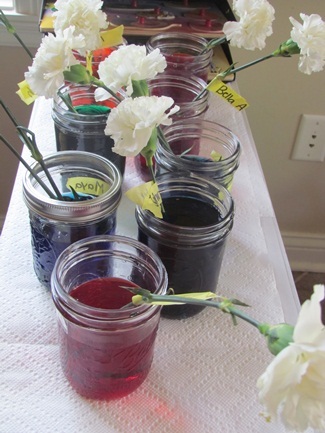 I usually prefer science that is more hands on than just visual, but Deborah at Teach Preschool shows us how to do this experiment with great success. 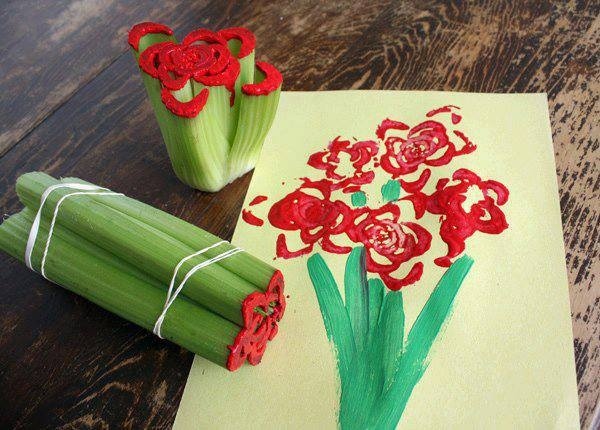 This can also be done with good effect, using celery. I wonder about finding some unbreakable containers for this instead of glass. However, there is something to be said about talking to children on safety rules and careful handling of fragile items. You have to assess your particular class and decide. Other than seeds you can grow avacado pits (well, that is a seed actually), green onions, carrot tops, pineapple tops etc. Click on the photo to the right to visit Laughing Kids Learn, and get the full instructions for growing your own carrot. I like to include life cycle or plant growth matching games to support the information being learned. You can visit my TPT store to buy a very inexpensive plant parts chart or look on Pinterst to be inspired to create your own. While you are there, check out the free downloadable file folder game with cute lady bugs. 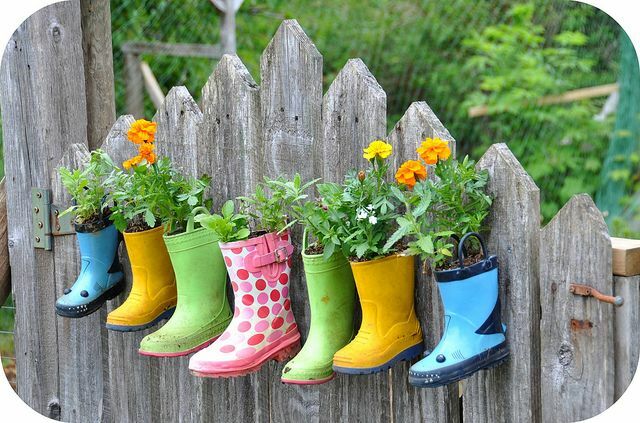 Very Spring-y! 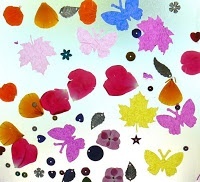 The butterfly life cycle above is a TOTALLY FREE printable from Preschoolmom.com. Here you will find many free printables for your Spring manipulative or science center! We love FREE materials and are always very grateful! How wonderful the fresh air is this time of year. We can truly appreciate being outdoors – what a sensory experience it is after being indoors so much. The children love to observe that the birds are chirping more, and many varieties have returned to their summer home. Who can spot the first robin? The tiny buds are visible on the tree branches and flowers such as crocus and daffodils are poking up out of the cold ground. Hallelujah! Below is a picture of something I hope to have one day. 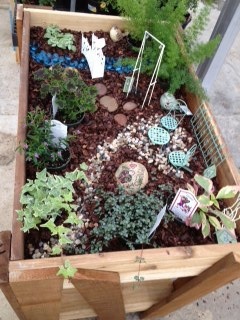 How fun and enriching it would be to have a little raised garden like this, in which to play and explore. Do you take your preschoolers outside when it is raining? We usually do not. However, if the weather is not too cold, I would consider it after reading this blog Let the Children Play. So many fun ideas and good explanations about why this can be beneficial. I also just participated in a webinar about outdoor spaces and outdoor play that touted similar philosophies. I am willing to give it a try. I would love to hear from you on this idea! « Rainbows and Shamrocks, lucky days in Preschool!